In the past I’ve posted about how hackers have figured out how to play videos on a Nook Touch and Kindle Touch, so this isn’t anything new exactly, but I’ve recently come across a couple of new videos and they are too strange to pass up. This time around we’ve got a couple of cartoons playing on the Kindle Touch and Nook Touch. When comparing the two, the Nook has the edge in speed and refresh rate—the video is smoother and less jittery. Video playback is better than you’d expect, in fact. The YouTube video description says the Nook is using the RockPlayer app and NoRefresh app. So that’s different than last time around when it was just playing animated Gifs using the Opera web browser. But the problem with playing video on the Nook is that it lacks audio support so you have to use sub-titles if you want to know what the characters are saying. But at least that’s technically reading, right? Video playback on the Kindle Touch isn’t as smooth as the Nook, but at least it has sound. The Kindle is using a special video player created by a developer over at MobileRead. It plays AVIs with MPEG4 video and MP3 audio. It’s always so strange to see E Ink ereaders playing video. It’s like watching an old black-and-white TV. Who Will be the Next to Release a Lighted eBook Reader? It’s more like watching an old movie filmed in 1895! 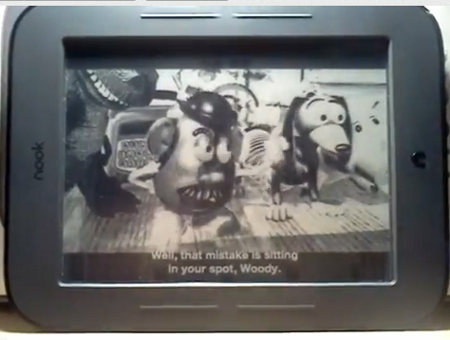 Those ereaders are no good for playing animated films like Toy Story. I’d like to see both ereaders play the same video side by side for curiosity. They might be adequate to play limited animation, like Yogi Bear, or the Powerpuff Girls. I will bet that a Sony PRS-T1 could play the cartoon videos as good as the Nook and with sound like the Kindle. Remember the Sony can run Android apps. Now thanks to ‘Renate NST’ you can also play sounds using USB audio card. Is this “Renate NST” an Android app? Does this mean it is easier to give a Nook sound than it is to give a Sony an Android platform? Nook really could use a “drag and drop” feature like Sony has. But going on what I know, I’d prefer a Sony PRS-T1 rather than a Nook Touch. Referring to the earlier article about Nook emulating the first Mackintosh desktop, I used to use a Mac. It was primarily a word processor, secondarily a BBS terminal, and it ran a dozen or so business applications. I’d be happy with an e-ink reader that can do what the classic Mac could. – I don’t have enough money to own both NST and T1 so i can’t say if it’s easier.